Wedgwood of the 1950s was a still-developing neighborhood with a lot of house construction in progress. Although Albert Balch’s original group of Wedgwood houses was finished (from NE 80th to 85th Streets on the west side of 35th Ave NE) work was still ongoing on the east side of 35th Ave NE in other plats such as Wedgwood Park. Later in the 1950s Balch began building houses farther west of 35th Ave NE, including property sold to him by the Picardos, from 28th to 30th Avenues NE. The Tradewell Grocery Store as pictured in 1962, was built in 1959 and is the present site of QFC at 8400 35th Ave NE. Photo courtesy of Seattle Municipal Archives image 76718. In the 1950s the commercial district of Wedgwood was not finished yet, either. There were some small cafes, delis and convenience stores but no sit-down restaurants and no hamburger drive-ins. Many new stores were going in, including Tradewell at the present site of QFC, 8400 35th Ave NE. This big piece of property from the corner of NE 82nd to 85th had never had any buildings on it during the long-time ownership of the Fulton family. After Balch acquired the property in October 1942 he used the site for storage and parking of his construction equipment and materials until such time as he had another place to put everything. Tradewell then leased the property and built a new store which opened in 1959. The other buildings on the site, including the Wedgwood Broiler, Homestreet Bank and others, were not built until much later. In the 1950s as Wedgwood grew as a neighborhood, there was not any planning of what kinds of businesses would be put in. At first, the neighborhood seemed to be mostly characterized by gas stations. At NE 95th Street, east side of 35th Ave NE, there are two car service businesses owned by Jeff Johnson. There were an incredible number of gas stations along 35th Ave NE in the 1950s. A look at the telephone book of 1958 shows thirteen gas stations between NE 65th to 95th Streets. At NE 95th Street, three of the corners had gas stations: Clif Lotz Chevron Station at the present site of the Morningside Heights Apartments; Bill’s Union Service at the present site of Johnson’s Auto Repair; and Wight’s Richfield Service at the present site of Johnson’s Spirit Gas Station, 9500 35th Ave NE. On the fourth corner of the NE 95th Street intersection, there has been a veterinary office at 9505 35th Ave NE continuously since 1951. The site was acquired that year from Morningside Presbyterian Church, which moved to 8008 35th Ave NE and changed its name to Wedgwood Presbyterian. As of March 16, 2013 the hair salon (gray building at right) at 8605 35th Ave NE had not yet been removed. Soil was being dug out of the lot due to environmental contamination from the 1950s gas station. In the background across the street is the new Jasper Apartments at 8606 35th Ave NE. One of the 1958 gas stations was the Miller & McInnis Service Station at 8605 35th Ave NE. It had a ground lease from Seattle City Light, where there was an electrical substation on the back part of the lot. After the gas station closed in 1968 a modular building was brought onto the site. From 1968-2013 the building was used as the office of Lakeview real estate (Simon Korch) and then in later years the building had a hair salon. 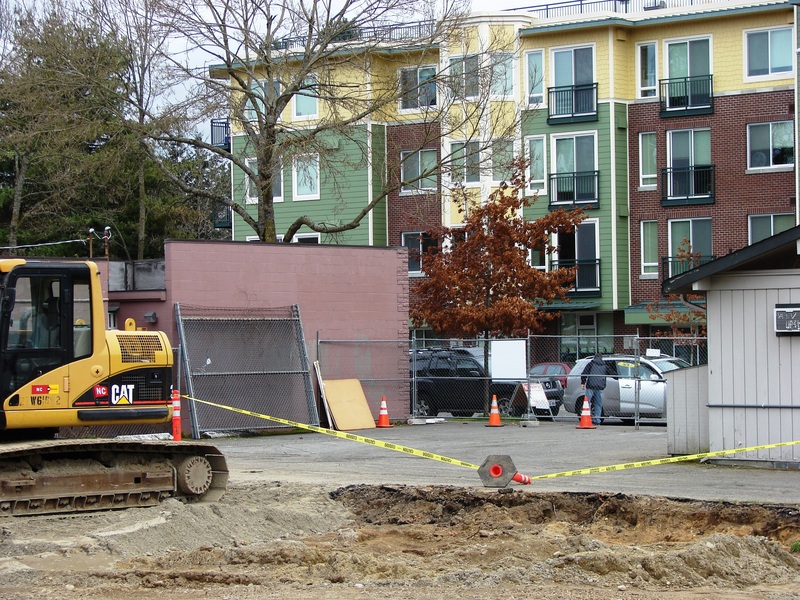 Pictured here is the process of soil contamination removal to prepare the site at 8605 35th Ave NE to become a “pocket park.” At right, the small gray hair salon building was modular (no foundation) and had been on the site since 1968, used for several different businesses over time. The building was demolished in November 2013. The Windermere Real Estate building at 8405 35th Ave NE was once the site of a neighborhood controversy: the construction of what was going to be a 19-cent hamburger restaurant. Looking north on 35th Ave NE, the Bank of America building is next to Windermere. Photo by Valarie. We have been advised that the operation will violate the zoning ordinance of the City of Seattle. It will also constitute a nuisance and substantially decrease the value of our property…….The whole purpose of the new restaurant seems to be the selling of packaged food to be consumed outside of the building which violates the city ordinance for this area. Our residential area was developed and has been known for its beauty and safety to children. We strongly urge that the Mayor and the Supt. of Buildings of Seattle investigate this matter and revoke this building permit. This particular type of eating establishment seems to be attractive to young people as a “hangout.” Our community has always endeavored to guide our children in constructive, wholesome activities during their leisure hours. This type of influence will tend to tear down what we have been striving to accomplish. We have issued a permit to construct and occupy a building as a restaurant. Both the plans and the permit are marked “not to be used as a drive-in.” The plans do not show facilities for a hand-out window or for “car hop” service. We have warned the owner as to the limitations and restrictions in this zone. It has been clearly stated that the use will be a restaurant. We therefore find no reason or justification to cancel this permit. This hamburger restaurant was in West Seattle in 1955, not in Wedgwood, but I show it here to illustrate the type of places which the Wedgwood Community Club did NOT want to have in the neighborhood. Photo courtesy of the Seattle Municipal Archives Item Number 168530. A Wedgwood District delegation won a zoning-variance dispute when the Planning Board disapproved a permit request from Maury Setzer, property developer, to put a detached advertising sign for a restaurant on property at 8405 35th Ave NE. The property is in a neighborhood-business zone in which signs must be flush with buildings. In the Seattle Daily Times article quoted above, it was revealed that Maury Setzer, one of Albert Balch’s development partners, was the one who had applied for the “restaurant” permit. This indicates that Balch & Setzer still owned the property and that Larry’s 19-cent Hamburgers was going to lease the site. Regulations were that business signage was to be “flush with the building,” meaning flat against the building and not at right angles or sticking out over the parking strip, nor in a free-standing sign as pictured above in a West Seattle 19-cent hamburger outlet. Maury Setzer had applied for an exception (a variance) for the signage for the “restaurant” in Wedgwood but the request was denied. Perhaps it was this application which alerted the Building Department that something was amiss, and there may have been an on-site inspection of the “restaurant” under construction. The Wedgwood Echo community newsletter of January 1959 told of the successful campaign to prevent the 19-cent hamburger drive-in, based upon a zoning violation. Construction of the hamburger place was stopped, and the site was later taken by a bank. Because of Wedgwood’s protest, within another six weeks, in December 1958 Seattle City Council took action to close a loophole in the building code. A “restaurant” was redefined as an eat-in, sit-down establishment. With Larry’s 19-cent Hamburgers as lessee, Maury Setzer had applied for the building permit as a restaurant but it did not meet the definition. I never found out who “Larry” was; no other “Larry’s” locations appeared in the Seattle phone book for the time period. Perhaps Larry went to an area outside of the Seattle City Limits to set up his 19-cent hamburger stand where there were no restrictions against drive-ins. Larry’s Hamburgers was to be on the present Windermere office site (at left) and the first bank building went in, instead. Eleven years later, the bank built the present brick building (at right, 8425 35th Ave NE) and moved over there. Photo by Valarie. Mylo Lindgren was WCC president in 1960. Like many neighborhood activists, Mr. Lindgren was a war veteran. The bank’s application to build, was at first turned down because of the zoning restrictions put in place after the 19-cent hamburger episode. In 1960-61, with Mylo Lindgren as president, the Wedgwood Community Club came out in favor of changing the zoning again so as to allow commercial development to have stores and banks along 35th Ave NE. 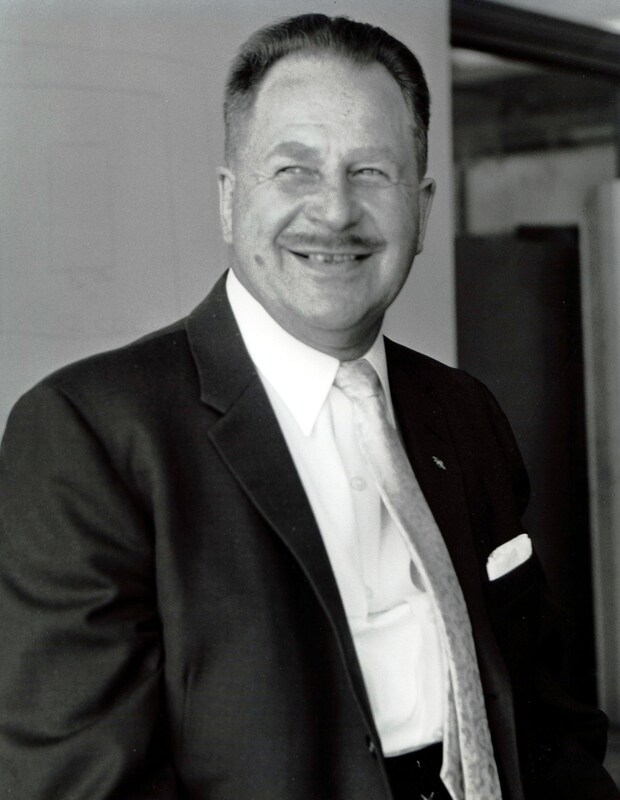 Seattle-First National opened its new branch office on May 25, 1961, with Wedgwood resident Jack Terhar as manager. The 1961 new bank building pictured below was at the present site of the Windermere real estate office, on the corner of NE 84th Street. Next to it was the Wedgwood Texaco on the corner of NE 85th Street. The bank was only in its first building for eleven years. In 1970-1972, after the gas station had closed, the bank rebuilt at that corner, which is the present Bank of America building. 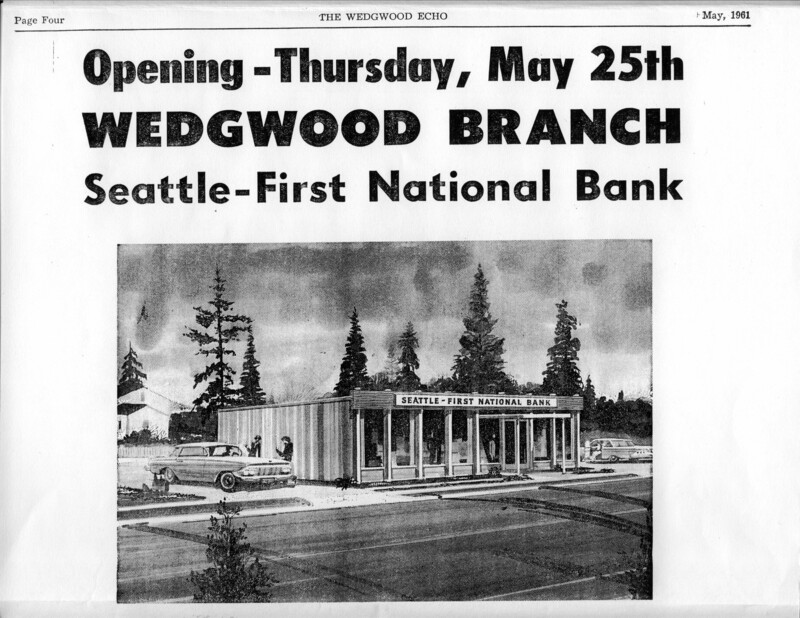 It had originally been planned to open the Wedgwood branch of Seattle-First National last November (1960) but the bank encountered zoning difficulties which necessitated several revisions of the building plans. Manager Terhar points out, however, that the delay has actually worked out for the best as it has provided time to make substantial improvements in the building design. The most important of these improvements is the inclusion of a standard bank vault and the installation of safety deposit boxes, a facility not included in the original plans. Zoning restrictions preclude a drive-in banking window. Albert Balch was a red-meat-eater, and perhaps he was disappointed that there would be no drive-in hamburgers in Wedgwood. Balch bided his time for the neighborhood uproar to subside, then in 1967 he leased out property next to Tradewell, on the east side of 35th Ave NE at NE 85th Street, for a small “hamburger restaurant” run by former staff of Lou’s 19-cent Hamburger Drive-In, Burien. Within the next two years Balch’s restaurant was upgraded to the “Sir Wedgwood” which featured steaks. In 1973 the restaurant name became Wedgwood Broiler. On the anniversary of Albert Balch’s birthday, March 16, 1903, we wish continued success to the long-running Wedgwood Broiler with its extensive menu, which includes hamburgers. Sir Wedgwood banner advertisement in the 1967 Wedgwood Echo newspaper. Seattle City directories, various years, accessed at the Seattle Public Library History Dept., 9th floor/downtown. The present Bank of America on 35th Avenue NE at the corner of NE 85th Street, has a drive-up teller’s window made possible by adjustments in zoning to allow the drive-up for banks, but not for 19-cent hamburgers. Seattle First-National was the first bank to come into the Wedgwood business district, in 1961 on the present site of the Windermere real estate office at the corner of NE 84th Street. There was still a gas station, Wedgewood Texaco, on the corner of NE 85th Street at that time. After the gas station closed in 1970 the bank “moved over,” building the present brick Bank of America which was completed in 1972. The design for the Seattle-First-National branch bank building of 1972 was by Benjamin McAdoo, the first African-American architect to operate a long-term practice in the State of Washington. The design was one used for the building of three bank branches including Wedgwood and Rainier Beach in Seattle, and Lake Hills in Bellevue. Source: “Benjamin F. McAdoo,” essay by Esther Hall Mumford, pages 328–333 in Shaping Seattle Architecture, second edition, 2014. The handles of the cocktail lounge doors at the Broiler have the initials “S W” for the original restaurant name, Sir Wedgwood. The Windermere Real Estate office building has been on the corner of NE 84th Street since 1985. Seattle Municipal Archives, Comptrollers File #235758 and #235805, “Protest of residents against hamburger drive-in.” These file numbers can be found on the SMA website but the contents are not on-line; the files are on microfiche which can be read in the research room, Third Floor of Seattle City Hall. Wedgwood Echo Community Club Newspapers, October 1958, January 1959, May 1961, and April 1967. “Zoning actions.” The Seattle Daily Times, October 25, 1958, page 20. This entry was posted in Balch, businesses, community club (old), Controversies and tagged bank buildings, gas stations, land use and zoning, Neighborhood History, restaurants, Seattle, Wedgwood business district, Wedgwood in the 1950s. Bookmark the permalink. What are those people doing next to the car at the 1961 First National Bank? Dancing? Love this history! We banked with SeaFirst before Bank of America bought them out. The history of banking is confusing, trying to follow the names. I do not know why Seattle-First National was only in their first Wedgwood building for eleven years. Perhaps they were successful enough that they needed a bigger office. They were the ONLY bank in Wedgwood until 1971. Now, in 2013 there are as many banks in Wedgwood as there used to be gas stations in 1957. Interesting. You wonder why? Were the small gas stations run out of business due to car dealerships taking over more car repairs etc? Or was this all tied to Mideast oil changes and regulations? I found it ironic that there is no record of complaints from the community club about the gas station right there on the corner of NE 85th Street, present site of Bank of America. That would have been just as dangerous for pedestrians, with cars pulling in there from both 35th Ave NE and NE 85th Street, as the proposed drive-in hamburger place. It is possible (haven’t confirmed this) that the gas station was leasing the site from Balch’s corporation, and that the bank either bought or leased the gas station site and moved over with an expanded building. They do own the property now. Interesting! When I moved to Wedgwood in 1985, there were gas stations on all four corners of NE 75th Street and 25th Ave NE. (Only one left.) And the corner of 75th and 35th, where the Chinese restaurant is now, was a Shell station. Thanks, Diana, you have a very sharp memory. The station on the southwest corner of 35th Ave NE and NE 75th Street, lasted into 1985++ according to listings in the phone books (accessed at the 9th floor history department, downtown Seattle Public Library.) The current building which houses Subway, Blue Plate Express, a dentist, hair salon and Chinese restaurant was completed in 1988 in place of the gas station.